See also sinking bubbles in stout beers: link. FAQ: Questions I've been asked about the research on stout beers. Figures from the paper "Bubble nucleation in stout beer" were taken from this movie. These papers adapt an existing model of bubbling in champagne and other carbonated drinks to stout beers which contain nitrogen and carbon dioxide and thus require widgets. We show the same bubbling mechanism is active and could be a potential widget replacement. The results and implications of the paper were discussed in the Economist Mathematicians invent a new way to pour stout and Nature Physics Stout Fizz-ics. Nature.com: The widget-free way to foamy stout. Improbable Research: Beer bubble appreciation in Limerick and limerick. The Economist's Babbage podcast: The physics of froth. Wired.com: Tiny Fibers Put the Head on Stout Beer. ABC Science: Paper leads to perfect beer head. The MIT Technology Review: Mathematicians Reinvent the Beer Widget. The Atlantic Wire: When You Give Beer to Mathematicians. Discovery Magazine's Discoblog: Mentos Is to Diet Coke as Coffee Filter Is to Guinness?! CNET: Math whizzes recalculate beer-foaming equation. Irish Examiner: It's in the can: Mathematical formula holds secret to perfect Guinness head. Irish Independent: Scientists get to the bottom of that perfect pint. Live Science: The secret to a frothy stout. MSNBC: How to build a better Irish beer. Science News: A bit of fiber makes for sudsier beer. Limerick's Live95: UL Scientists crack code for perfect pint. Scott McKechnie has a degree in Physics and Computer Simulation from Trinity College Dublin and was a summer intern with the MACSI research group. Michael Devereux is a final year PhD student in applied mathematics. 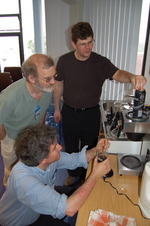 Modelling the initiation of stout beers was a problem submitted to the 70th European Study Group with Industry ESGI70. The study group was hosted by the MACSI group at the University of Limerick. This year we hosted ESGI82. MACSI and University of Edinburgh Researchers investigated waves in the sinking bubbles of stout beers. M. Robinson, A. C. Fowler, A. J. Alexander, and S. B. G. O'Brien. Phys. Fluids, 20:067101, 2008 (pdf 0.5MB). We would like to thank Science Foundation Ireland, SFI for making this research possible by supporting the MACSI research group through Mathematics Initiative Grant 06/MI/005. Michael Devereux's postgraduate fellowship is funded by the Irish Research Council for Science, Engineering and Technology, IRCSET.